Motivate all year long with an employee of the month program that truly shines. 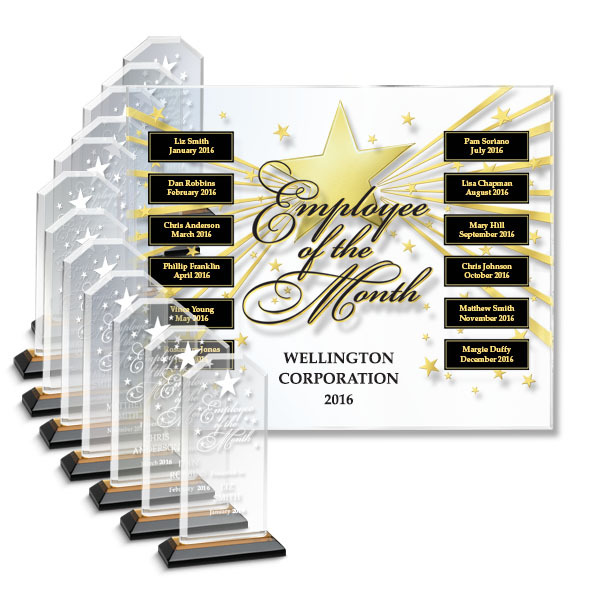 A shimmering gold star design printed on the front and back of this beveled annual perpetual plaque gives the thick, clear acrylic an outstanding three-dimensional look. The Individual Star-Studded Award features a beveled gold-mirrored black base that reflects hints of gold through the elegant clear acrylic. 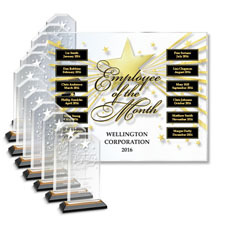 We also offer a Star-Studded Employee of the Month Basic Recognition Program -- click here. Upon ordering the Premium Service, you will receive your Annual Plaque. Every month, when you submit your recipient’s information, we will send out one engraved nameplate for your Annual Plaque and one engraved Individual Award per recipient.